Beat the Gas Price Increase With These Helpful Tips! Bad news for drivers out there; gas prices are on the rise. Hopefully it won’t be long before they go down again, but it’s best to prepare just in case. To that end, we’re here to help you with some tips on what you can do to keep your costs down. You don’t have the power to make the numbers with dollar signs next to them go down, but you can make sure you’re getting the most out of your vehicle. PRNewswire has put together a good list, courtesy of the Car Care Council, of what you should be doing to help ease the pain you feel when reaching for your wallet at the pump. Reduce your gas mileage by 4 percent by keeping your car tuned. Take a look at the speed limit. When you’re above 50 mph, your gas mileage goes down fast. For every 5 mph over 50 you go, that’s an additional 25 cents per gallon for gas. Don’t idle your car. You only need a minute or two to heat up your car. Don’t do any quick starts or stops. In the city this can lower the gas mileage by 33 percent and 5 percent when you’re in the city. Bunch trips together. It’s better to make a lengthier trip than multiple shorter ones. Check to make sure you don’t have extra weight in your car. Empty out unnecessary things from your trunk and back seat. The added weight can be causing you to need more gas than you normally would. Follow these pieces of advice and you may find yourself more capable of weathering higher gas price periods. 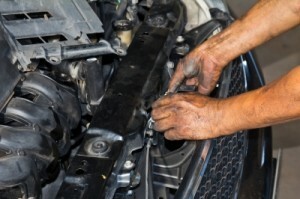 If you’re in the Queens area and are in need of a tune-up, stop by Bayside Chrysler Jeep Dodge. We offer monthly parts and service specials for you to take advantage of. Make sure you like us on Facebook and follow us on Twitter for more tips and monthly offers.